Rainbow Words- Learning our Sight Words | My Attempts at Being Creative! It is the time of the year where we really start to learn our sight words. For my students, this is a very hard thing to do. Most of my IEP students have not mastered letter identification and letter sounds yet. Even though they do not know all the letters and sounds that does not mean that I am not going to teach sight words. For instance, all my students know the word the but they may not know that the letters are t-h-e. I base my sight words off of a few things. One place we get our sight words is through FAST. On top of FAST we also have a list of 50 Kindergarten sight words and when they are in first grade they work on Bedrock Sightwords. So, I took from all of them and came up with our 60 sightwords that I want them to know/be exposed to by the end of the year. We call these our Rainbow Words. You can choose any set of words to use and determine how many will be in each color depending on your group. I post these on my whiteboard. I debated whether or not to show this two ways. The first way, which I decided on using, was to have all the words up on the whiteboard from the beginning. This way they can see them when they are reading and writing and use it as a resource. 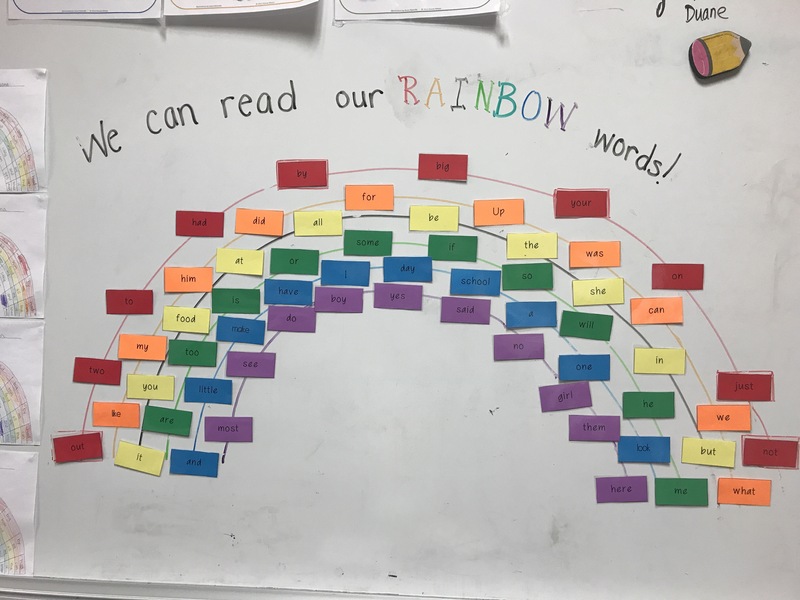 The second way I thought about using the rainbow words was to have the outline with dry erase marker on the board already and then put up the words that all the kids were proficient in to grow our rainbow and watch our learning progress. Since I have a small number of students the second way would work for me. I ultimately decided on using them the first way I described because I teach 5 different small groups a day and each group is at their own place with learning sight words. I would have to constantly change the board between groups and that is just not possible some days (ok most days). I introduce 5 new words a week and test sight words every other school week (according to IEPs). I found something online years ago that I try to follow when teaching sight words. It was called sight word soup. First, introduce the word in isolation and then by the end of the week they are reading and writing the words in context. This is how my overall week looks like with sight words. I aim to make these activities take about 5 minutes. Monday- Introduce 5 new words (try not to make them to similar so they are not confused). First we look at each word individually and look for any known parts/sounds. We spell the word and use some sort of manipulative to create each word (play dough, salt, rainbow writing, wikki stix, etc…). I then write them in a little book (mini composition books) for my students to practice throughout the week. Tuesday- We play a sight word game like Go Fish, Memory, Guess the Word (like hangman). I use all of the weekly words and then some past words that students may not be solid in yet. Wednesday- I use sentence strips to write a sentence using each of our weekly words. I try to incorporate words that they have already learned so they are not spending the entire time trying to decode other words. Thursday- As a group we create our own sentences using each word. We then use interactive writing to write our sentences together, highlighting our weekly words. Friday- I have the kids write their own sentences using the weekly words. In addition to this we practice reading all the rainbow words that we have learned at the beginning of group. Below is how I keep track of student data. 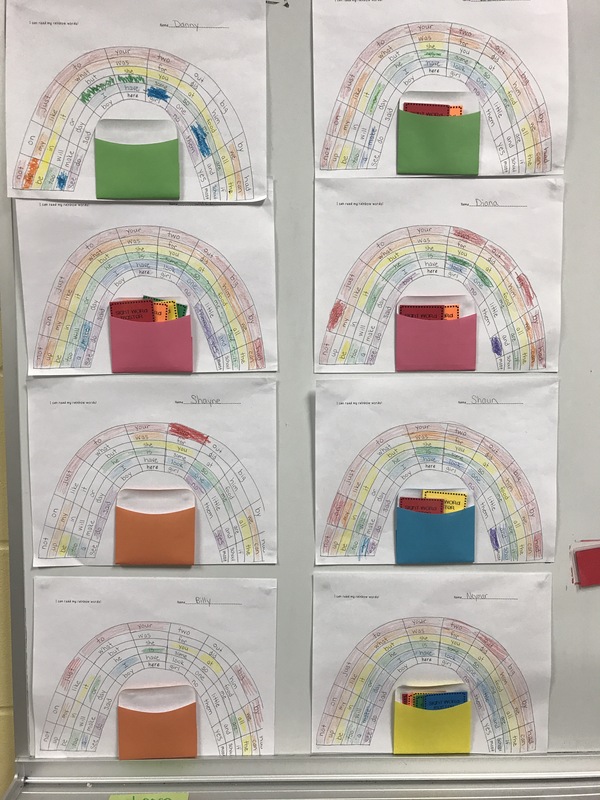 Each student has a rainbow that they get to color when they know the sight word. 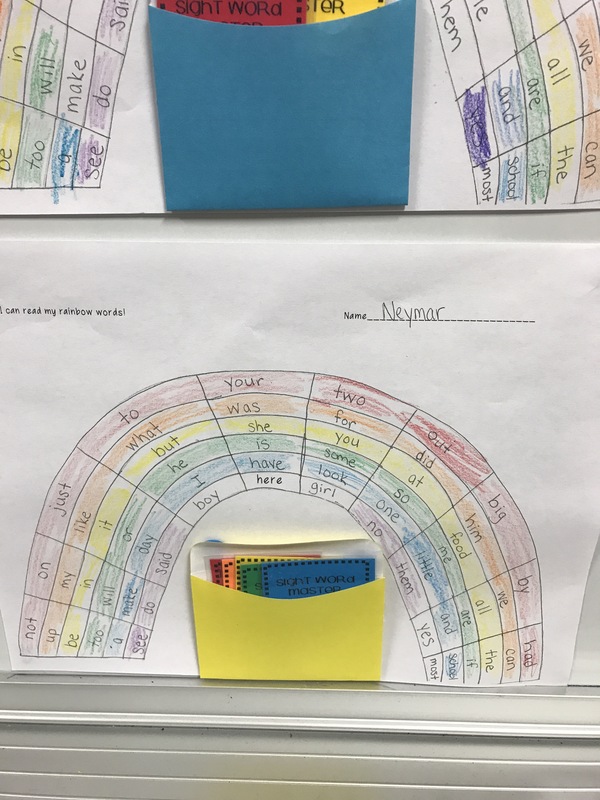 I put a library pocket in the center and created a little brag tag for each group of colored rainbow words that they receive when they know all the sight words in that color block. This helps me see which word they are still struggling with and which ines they know.